Emmanuel is one of the greatest stories of determination, perseverance and being a change agent that I have ever heard! Emmanuel was born in Ghana with one working leg and his mother was told to kill him because he was a curse.He hopped three miles to and from school and eventually taught himself to ride a bike with one leg. Emmanuel then rode more than 400 miles around Ghana to raise awareness of people with disabilities. Emmanuel ended up earning the Arthur Ashe Courage Award, his story was told in an Oprah narrated documentary and he continues to work with African leaders to increase awareness of people with disabilities! 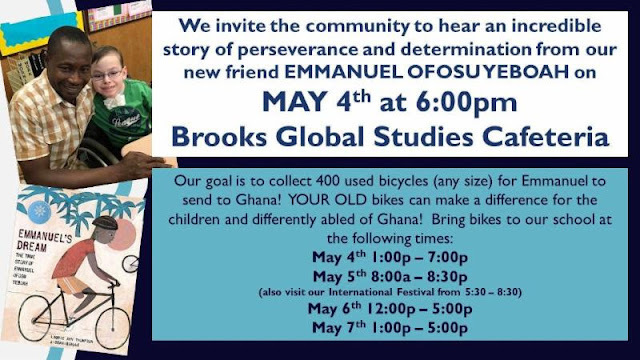 EMMANUEL WILL BE BACK IN MAY AND WE ARE GOING TO HELP HIM COLLECT 400 USED BICYCLES TO CHANGE PEOPLE'S LIVES IN GHANA! Check times on the flyer! PLEASE COME AND PLEASE SHARE!!!! 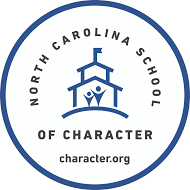 pre-orders will include the student's name and photo on the front cover of the book! Flyers to come home in Monday folders very soon.